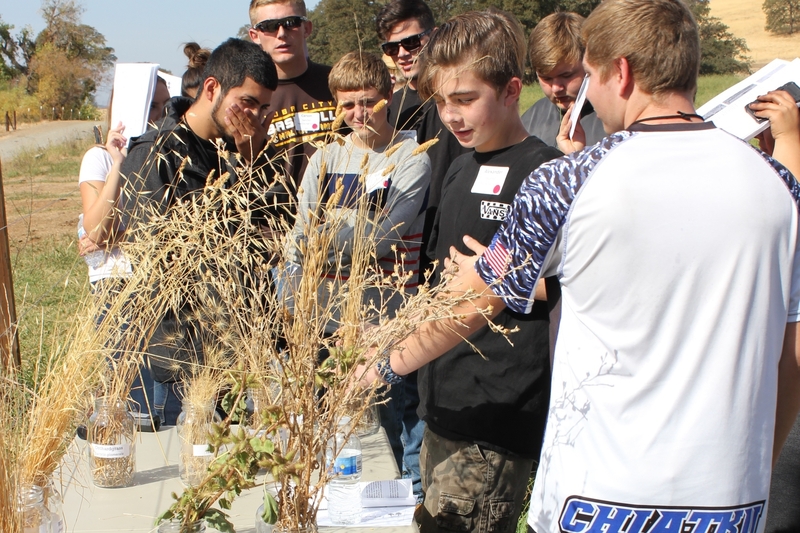 Over 160 high school students enrolled in FFA and 4-H programs across four counties spent the day at UC SFREC on October 7th, exploring key topics related to beef cattle and rangeland management. Assembly member James Gallagher, who has strong ties to local agriculture in the Sacramento Valley, kicked off the day with a forward looking key-note address that highlighted the important role the current generation of students will play in addressing California's agricultural and natural resource needs over the coming decades. Following this address the students rotated through five hands-on learning demonstrations developed by UC researchers that explored major topics in beef cattle and rangeland management. Dr. Bret McNabb, DVM from the UC Davis Large Animal Clinic, discussed evaluation of health issues in beef cattle with Dr. Myra Blanchard from the UC Davis College of Veterinary Medicine following up by highlighting ongoing vaccine research for Epizootic Bovine Abortion. Dr. Jim Oltjen from UC Davis Department of Animal Science discussed the use of technology in managing cattle and pasture while UC SFREC staff member Dan Macon led students through a hands-on demonstration exploring the principle of animal behavior as it relates to low stress livestock handling. 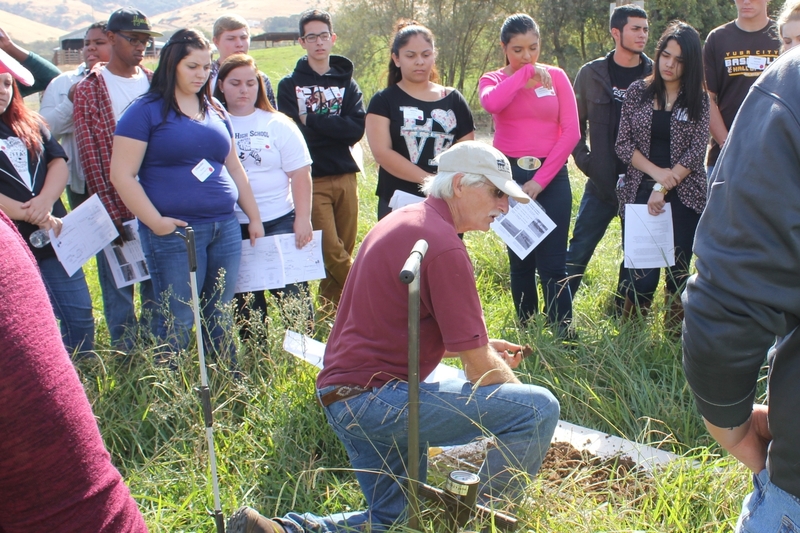 In the 5th module, Roger Ingram, UCCE advisor in Placer/Nevada/Yuba & Sutter counties demonstrated principles related to dryland and irrigated pasture management. 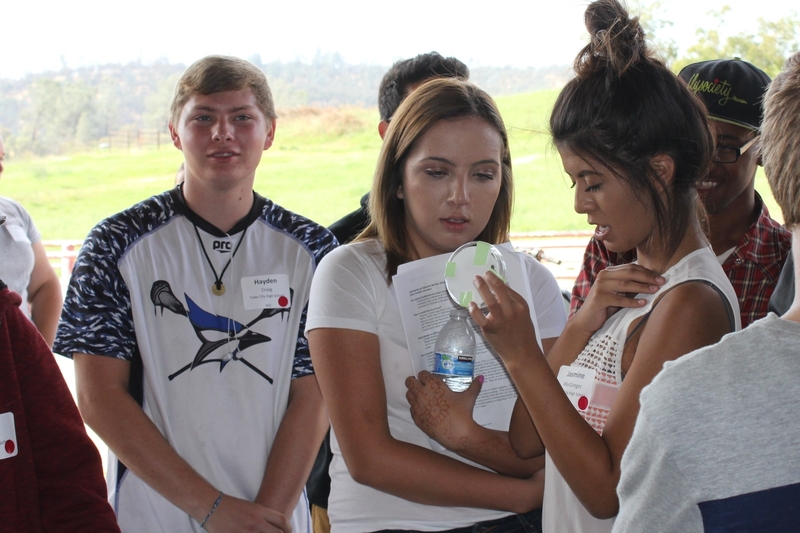 Sponsors including Robinson Ranch, Farm Credit West and Yuba-Sutter Farm Bureau and the time donated by FFA leaders and UC staff were instrumental in making the second year of this annual event a major success and a great opportunity for students to interact with ongoing research led by UC. Epizootic bovine abortion (EBA), also referred to as foothill abortion, is one of the most serious cattle diseases in the Western United States. UC researchers, Professor Jeff Stott and Specialist Myra Blanchard from the UC Davis School of Veterinary Medicine have made major headway in developing a vaccine for this disease and currently are mid-way through a multi-year field trial examining vaccine field efficacy. This disease is carried by ticks and is present in many foothill regions making SFREC a natural outdoor lab to evaluate field efficacy. 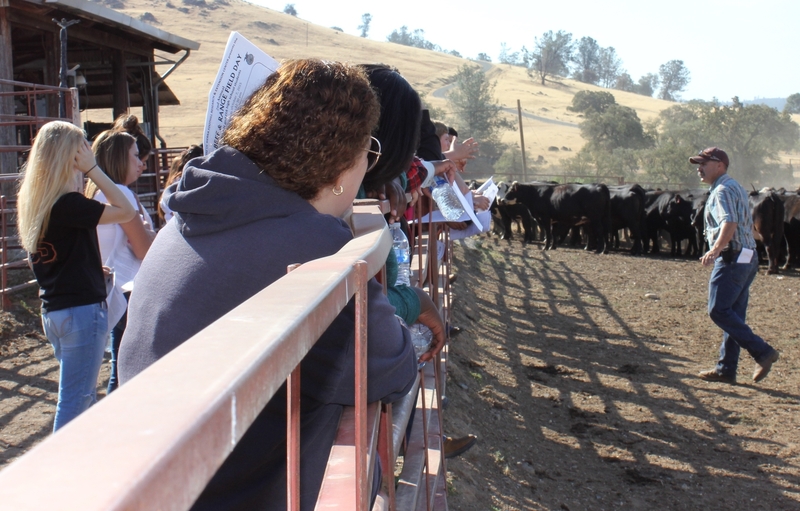 Last Wednesday researchers checked pregnancy status and condition on heifers assigned to the study. By August, heifers will be moved to irrigated pasture where SFERC staff can monitor animals closely for how the vaccine improves calving success and calf health. To read more about the efforts of SFREC researchers to combat foothill abortion, click here. For background information on EBA visit UC Davis Veterinary Medicine and to learn more about managing EBA to reduce impacts on your herd, please click on the below attachment. Small black dots can be seen from afar amidst the Lower Ranch fields at the Sierra Foothill Research & Extension Center. Upon closer inspection, those spots morph into fuzzy, knob-kneed, curious little calves that are sure to insight many cries of “Awwwwe!” from visitors. The first live calf born at SFREC this season. He is a curious little bull. However, to a seasoned rancher those cute calves are a testament to the worthwhile blood, sweat, and tears that were shed leading up to a successful delivery. 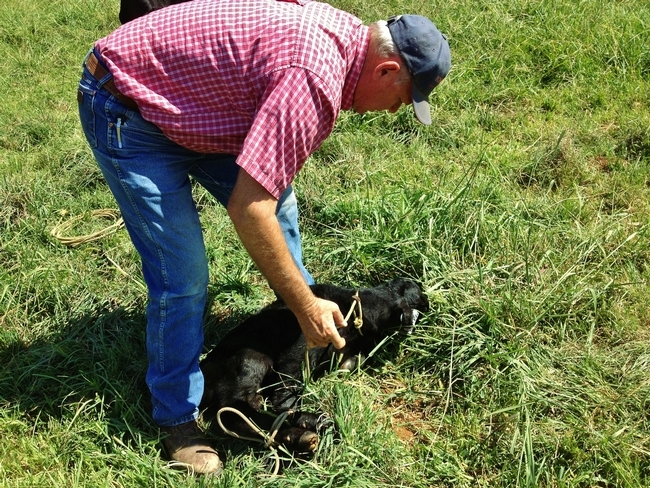 A healthy calf is the ultimate goal of any cow-calf manager, but once those critters finally do take their first breaths, the work has just begun…again. 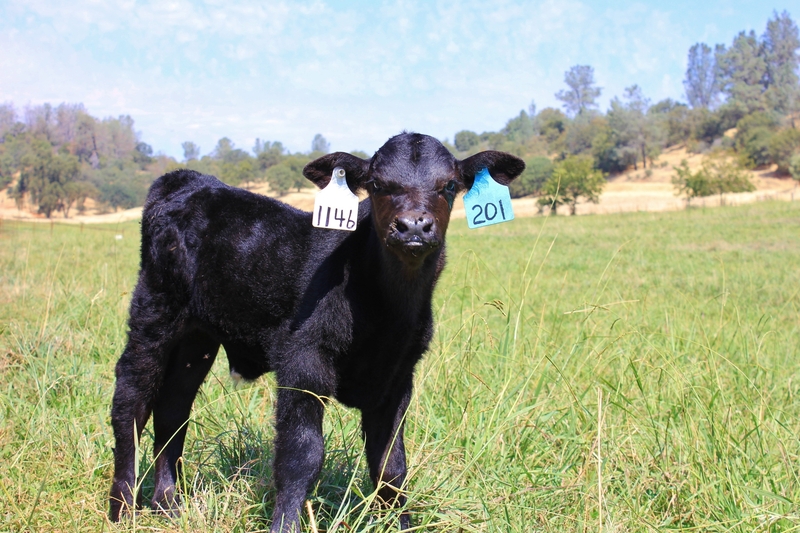 In the Sierra Foothills, healthy calves signify a greater achievement - the triumph over a bacterial disease called epizootic bovine abortion (EBA). Extensive research has been conducted on this economically devastating problem, with annual losses in the range of 45,000 to 90,000 calves in the state of California alone. EBA is commonly termed “foothill abortion” due to the regional outbreaks affecting only foothill, semi-arid and mountainous ranges of California, parts of Nevada, and southern Oregon. Through studies and research efforts by scientists associated with UC Davis, known information and management strategies have made slow, yet very significant progress since the recognition of EBA in the 1960's. For example, the culprit of EBA has been identified as the soft-shelled tick Ornithodoros coriaceus – explaining the climatic limitations of the disease so far. 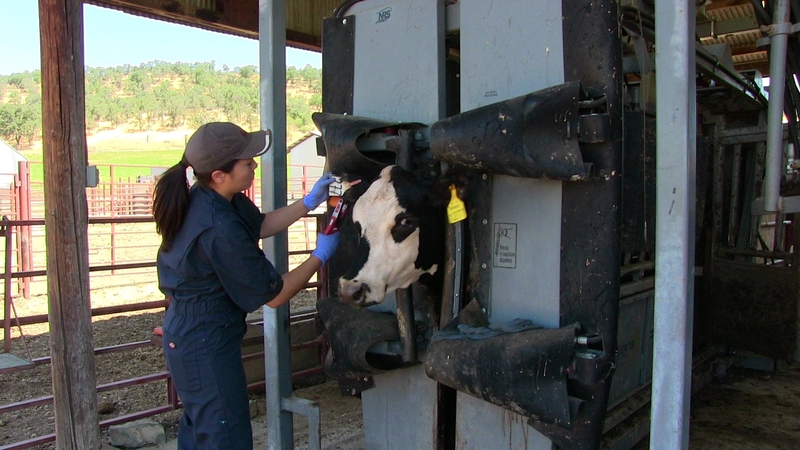 There is no commercial vaccine on the market today, but a current project at SFREC, led by UCD Veterinary Medicine Specialists Jeffrey Stott and Myra Blanchard, is addressing this problem. EBA is such a burdensome issue that both public and private sectors of the beef cattle industry -specifically the Ag Experiment Station, Rustici Endowment, USDA Formula, and the California Cattlemen's Association - are funding current research to establish a highly efficacious vaccine. Ongoing research at this center has helped determine the safety and efficacy of a candidate vaccine. Faculty and site conditions at SFREC have provided the ideal atmosphere for useful data collection. Staff Research Associate Nikolai Schweitzer is charged with the task of checking the irrigated fields daily for signs of aborted fetuses. 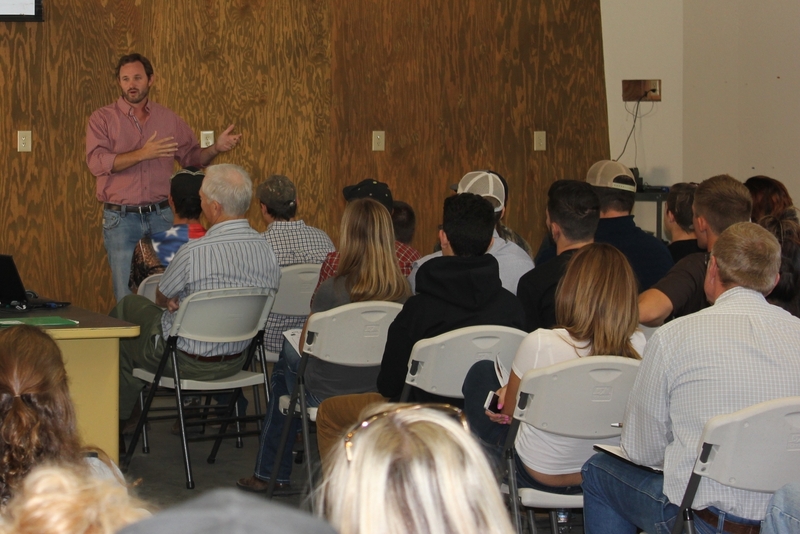 “It's important to be highly aware and check the fields at least twice a day. The scavengers in this area move in quickly!” said Schweitzer. All aborted fetuses are transported to UC Davis for additional lab tests to accurately determine if EBA was the cause of death. Infected cows do not show signs of the disease during pregnancy because the bacteria is transmitted to the immature fetus where it proliferates and results in a late-term abortion. Fortunately, the outlook for the candidate vaccine is very promising. The release of an effective EBA vaccine in the future will save ranchers countless hours of disappointment and headaches, while beefing up their worn wallets! This will be another significant feat for the cattle industry, SFREC, UCANR, and animal scientists in the West. 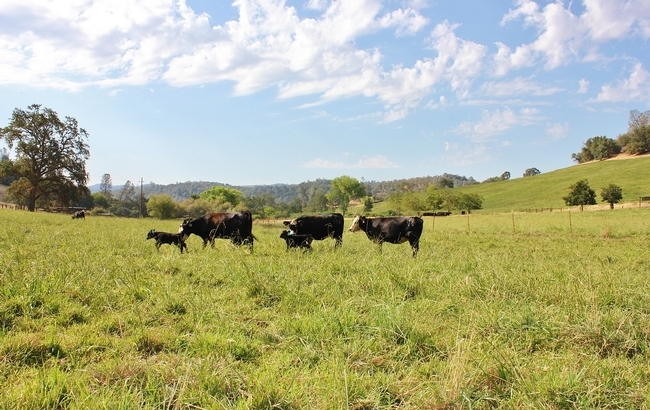 Happy cows and calves frolicking in the irrigated pasture at SFREC.